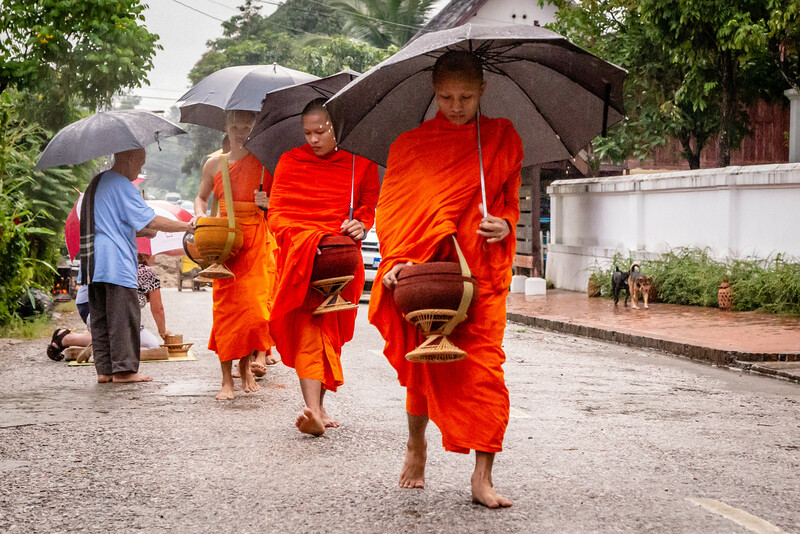 Recently, while visiting Luang Prabang, Laos I had the opportunity to witness ‘tak bat’ the alms giving; one of the most enduring and vivid images of the city. It was drizzling rain and the skies were just beginning to reveal their gray and as we walked a few short blocks to Th Kamal Street, one of the most popular places to view the procession. The street was silent except for the sounds of crowing roosters and some stray dogs quarrelling over a few scraps. 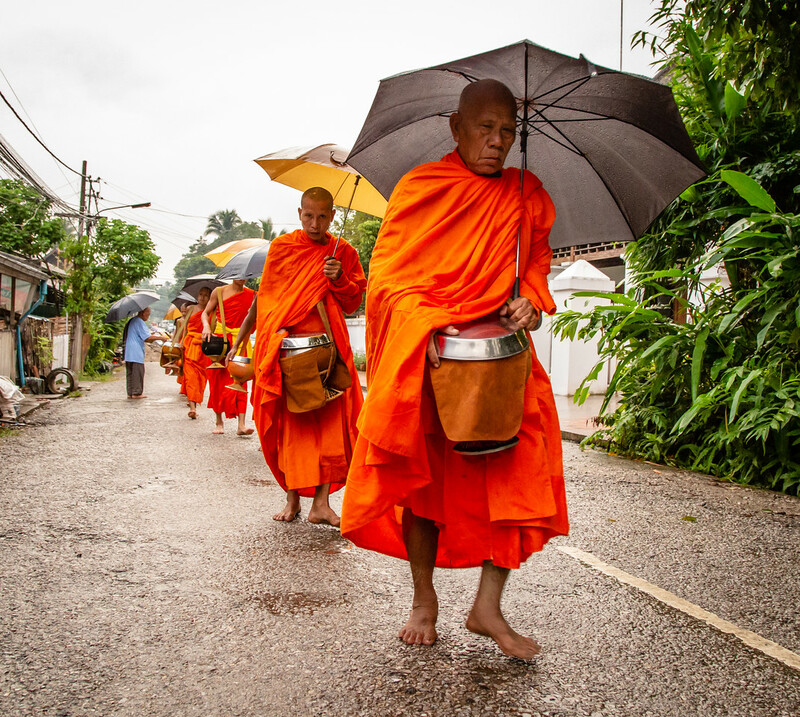 The monks arrived clad in their saffron robes, walking single file with their alms bowls, on straps in front of them, and umbrellas over their heads. As they passed, eldest first, the laity, some standing – some kneeling, placed offerings of sticky rice, incense and flowers into the monk’s bowls. It all happened almost without sound. Only the rain and the monk’s bare feet padding on the pavement were could be heard. Even the dogs and the roosters seemed to keep a respectful silence as the procession passed. 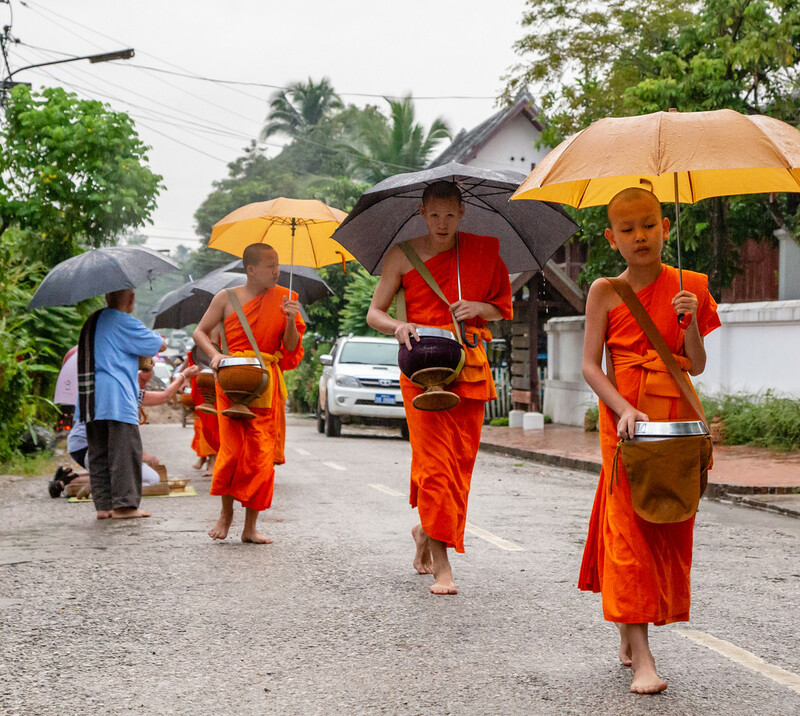 It is important to remember that the tak bat alms giving ceremony in Luang Prabang is not a cultural show put on for the enjoyment of tourists but an age’s old religious ceremony to be respected. It is important to dress properly with shoulders, torso and legs covered. And you should remember to remove your shoes if you’re giving alms. Don’t take flash pictures which could disturb the monk’s walking meditation, don’t make inappropriate noise and stay out of the way of both the monks and the alms givers. 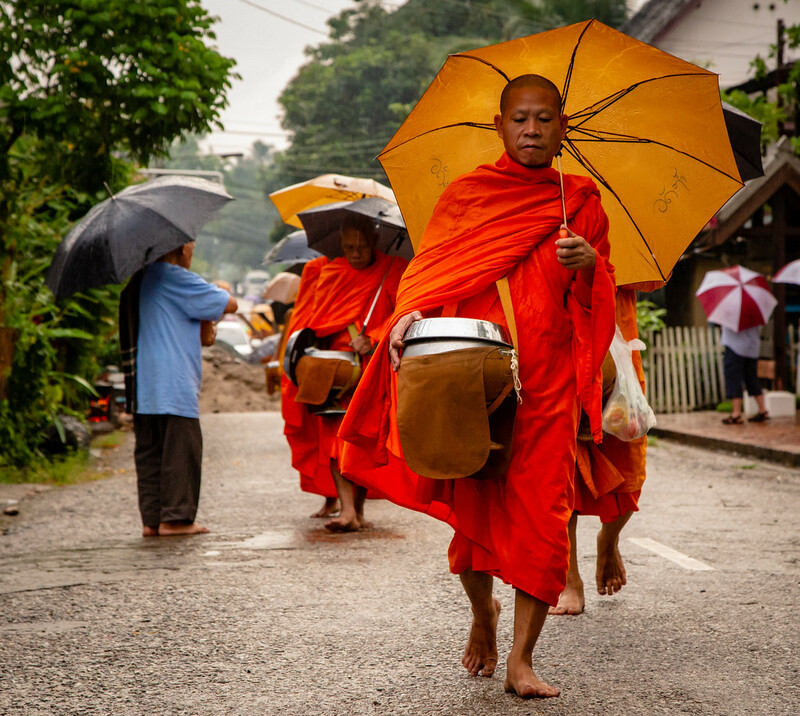 Because some tourists can’t be respectful and follow the simple rules, some Lao officials are considering stopping the alms giving ceremony. That would be a shame.